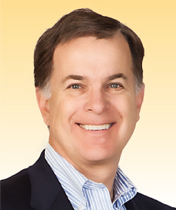 Atherton | Hugh Cornish : Real Estate of Atherton, Menlo Park, Portola Valley, Woodside and Palo Alto. Peninsula homes of the Bay Area. Atherton is named for Faxon Dean Atherton, a wealthy trader from Chile, who purchased 640 acres and established the first large estate in the area. The completion of the railroad in 1863 attracted other prosperous citizens of San Francisco, hoping to escape the summer fog. The Town was incorporated in 1923, and adopted stringent zoning regulations. As a result, Atherton retains the pastoral atmosphere enjoyed by those nineteenth century residents, with majority of properties in this exclusive zip code exceeding an acre. No sidewalks, an abundance of heritage oaks, and a ban on commerce, plus equal access to San Francisco and San Jose have made Atherton one of the most expensive addresses in the country. Atherton has been consistently ranked by a national magazine as one of the top five most affluent cities in the country. 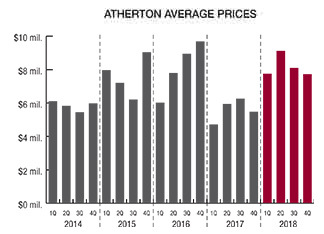 Residential property values in Atherton reached a record high in 2018, following a year when far fewer high-end homes sold, thus resulting in significant declines in 2017. The average price of a home in 2018 rose by $2,568,953, or 45%, to a record high $8,323,358. The average sale price in Atherton in 2017 was $5,754,405 and in 2016 it was $8,212,907. As shown in the quarterly average chart, the second quarter of 2018 saw the highest average price of $9,098,440, although it was still lower than the record set in the fourth quarter of 2016 when it exceeded $9.6 million. 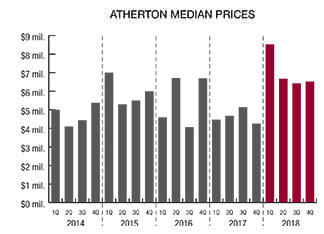 The median sale price of an Atherton home in 2018 also increased dramatically rising 40% to $6,650,000. This compares to a median price of $4,750,000 in 2017 and $6,002,500 in 2016. Keep in mind that any properties sold in Atherton off the Multiple Listing Service (MLS) are not part of this review. The median price has more than doubled since 2012 and has increased 138% since the recession low in 2009. The average price has increased even faster, more than doubling since 2013 and rising 151% since the recession low in 2009 when the average price was $3,311,604. Far fewer homes sold over list price than in years past but there were still 17, or 25%. There were also 11 homes, or 16%, that sold at list price and 39 homes, or 58%, that sold for less than list price. 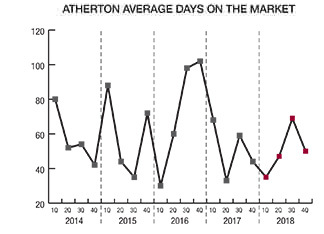 The average days on market, at 52, was higher than it was in 2017 when it was 47 (the lowest in recent records of 17 years). It is also 50% lower than it was in the recession years. Pricing was still key to how long a home was on the market. This direct correlation is seen with homes that sold for list price or more, which were on the market an average of 15 days; homes that sold for less than list price were on the market for an average of 78 days. 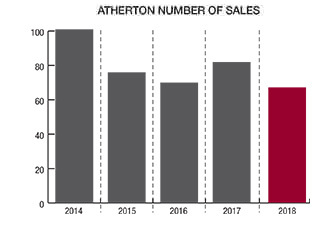 In 2018, the total number of closed escrows in Atherton (per the MLS) totaled 67, far fewer than the 82 homes that sold in 2017 and the lowest number of sales since 2008 when 61 properties closed escrow. Though Menlo Park has its share of luxury properties, its character remains essentially modest. Charming, custom homes on pretty lots line quiet streets. The downtown business district offers a picture of suburban life as shoppers stroll beneath the trees, stopping for a sidewalk coffee, or an ice cream cone. Originally growing up around the train station, built in 1866 and a registered historic landmark, the City of Menlo Park was incorporated in 1927. The name was taken from the sign “Menlo Park, 1854” which was painted on the gate erected by two early settlers who emigrated from Menlough in Ireland. Today, the excellent school system and the strong sense of community have made Menlo Park a highly desirable place to work and live. Menlo Park is also headquarters for much of the venture capital money fueling the Silicon Valley economy. A record high average sale price in Menlo Park was once again reached with an increase of $270,233 to $2,611,707. This represents a 12% increase compared to 2017, when the average price was $2,341,474. Contributing to this increase was a record high sale for an individual home at $10,075,000 (which sold for more than list price) plus three homes that sold between $7 million and $8 million. 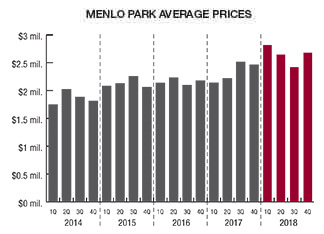 Menlo Park average prices have steadily increased every year since the recession low in 2009 when it was $1,242,293. The average price in 2018 represents an increase of 110% since 2009. 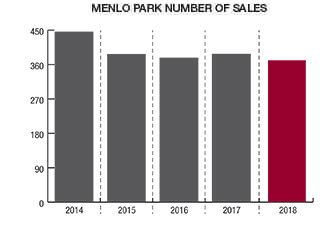 In 2018, the median sale price in Menlo Park climbed by $200,000 to a record high of $2,300,000, representing a 10% increase. At the recession low in 2009, the median price was $1,097,500; today’s median price is 110% higher. Keep in mind that any properties sold in Menlo Park off the Multiple Listing Service (MLS) are not part of this review. 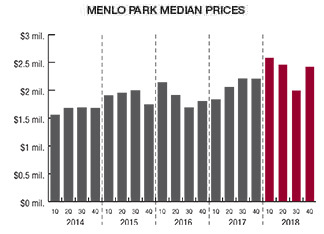 With prices increasing like this, it’s no surprise that the strong demand resulted in many Menlo Park homes selling with multiple offers and for more than list price. In fact, 241 homes, or 65%, sold for more than list price and by as much as 63% more. Homes also sold quickly with an average days on market of 20 compared to 23 days in 2017. Half of all sales occurred in 12 days or less holding steady with the past six years. 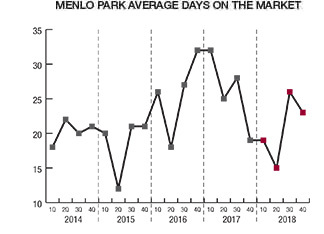 The number of closed escrows in Menlo Park, including single-family homes and townhomes/condos, declined in 2018 to 370 compared to 387 in 2017. This is the lowest number of sales in recent records dating back to 2002. The number of new listings remained relatively low. In 2018, there were 475 new listings compared to 419 in 2017 but to put this in perspective, there were 600+ to 800+ new listings every year between 2002 to 2010. The fewer number of homes for sale is directly correlated to the continuing increase in prices. In Portola Valley, named for the Spanish explorer Gaspar de Portola, oak-studded meadows open onto vistas of San Francisco Bay and the unspoiled Coast Range. The area’s first settlement was the logging town of Searsville, founded in the nineteenth century. Farming and cattle ranching were the primary industries until the 1920’s. After World War II, the valley began to be developed, typically with modest, ranch-style homes on large lots. Long a preferred address of Stanford University professors, Portola Valley has made well-staffed, well-equipped public schools a top priority. The town was incorporated in 1964, with the goal of maintaining the rural ambience of the community, and preserving open space. Today, Portola Valley is known for its unpretentious lifestyle and small-town atmosphere. 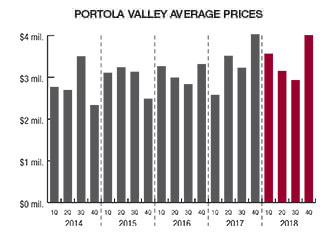 In 2018, the average sale price of a Portola Valley home was almost the same as 2017’s record high. With just a slight decline of $34,861, the year’s average price ended at $3,461,909. This is a drop of less than 1% and is still 87% higher than it was in the recession low of 2010. However, the median price was 11% higher than it was in 2017 and was a record high at $3,340,000. This is more than double what the median price was just 9 years ago when it was $1,650,000 in 2009. Keep in mind that any properties sold in Portola Valley off the Multiple Listing Service (MLS) are not part of this review. The fourth quarter of 2018 had the highest average price of the year when three of the four highest sales (all in the $6 million price range) closed escrow. Following suit, the median price was also the highest in the fourth quarter; contributing to this was the fact that there were no sales for less than $2.1 million. 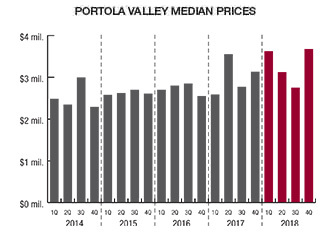 Strong demand for homes in Portola Valley was clearly evidenced by the number that sold for more than list price. Of the 60 sales, 29 sold for more than list price, which represents 48%. One home sold for 66% more than list price and 10 homes sold for double-digit percent increases over list price. 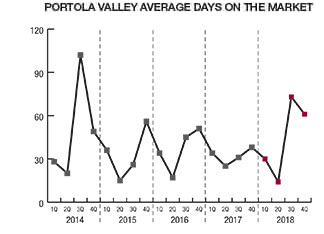 It took longer to sell a property in Portola Valley in 2018 at an average of 41 days, up from 32 days in 2017 and from the record low 30 days in 2015. This is still much faster than it was between 2002 to 2012 when the average days on market was 57+ and some years reaching 80 days. On a very positive note, half of all sales in 2018 occurred in just 11 days or less. 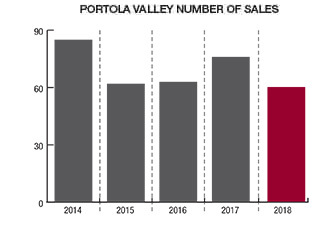 The number of closed escrows in Portola Valley fell from 76 sales in 2017 to 60 sales in 2018, the lowest number since 2010 when there were 53 sales. The highest number of sales in the past 10 years was in 2014 with 84 sales. Woodside, as the name might suggest, began as a logging town centered around the Woodside Store. Beginning in the 1830’s, the local sawmills supplied the first growth redwood lumber used to build much of old San Francisco. As early as 1852, a regular stagecoach ran between San Francisco and Woodside, which by that time had developed into a community of farms, cattle ranches and vineyards. The forested seclusion of the area attracted well-to-do San Franciscans, who began constructing often-elaborate county estates, some of which still exist. Woodside was incorporated in 1956 with the purpose of limiting development and preserving the bucolic character of the Town. Today, most of the parcels in central Woodside are a minimum of three acres. Horses are a common sight, and there are several equestrian facilities, as well as miles of trails. 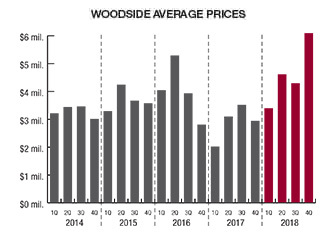 Dramatic record high prices were reached in Woodside in 2018. The average price of a home reached a new high of $4,547,957, representing a 51% increase over 2017. This is $1,526,861 more than the average price in 2017 when it was $3,021,096. 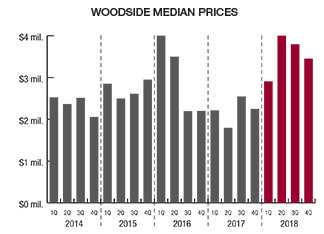 Since the economic downturn in 2009, when the average Woodside price was $1,986,344, this represents a significant 129% increase. The median price increased even more, rising 52% to a record high of $3,500,000. 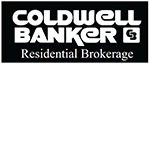 This is a 125% increase since the recession low in 2009 when the median price was $1,555,000. Keep in mind that any properties sold in Woodside off the Multiple Listing Service (MLS) are not part of this review. The high end of the market was strong with three sales for $11 million to $20 million – all contributing to the average price increase. 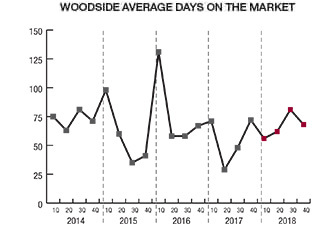 While prices were higher, it took longer to sell a home in Woodside during 2018 with an average of 68 days. This compares to 52 days in 2017, which was the lowest number of days on market in recent records dating back to 2002. There were 5 years during that time that the average days on market exceeded 107. 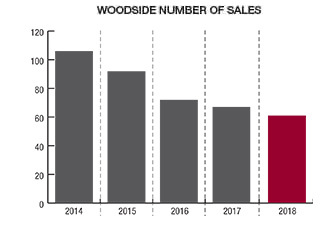 The demand for homes in Woodside was evidenced by the number that sold for more than list price. Of the 61 sales, 19 sold for more than list price, which represents 31%. Eight homes sold for a double-digit percent increase over list price, by up to 23%. In 2018, the number of sales declined from the 69 closed escrows in 2017 to 61 in 2018. This represents a 12% decline. In comparison, in 2009, there were only 41 closed escrows, which represented the lowest total since I began writing my real estate review in 1999. The highest number of sales in recent years was in 2004 when there were 108 sales and more recently in 2013 and 2014 when there were 103 and 107 sales, respectively.